The Blind Cat Rescue is one of our favourites. We think they are wonderful. That is a wonderful thing and Rescue Roast sounds darn good! I think it is awesome that Blind Cat Rescue is one of the rescues being supported in the Cat Ruler of the World campaign! 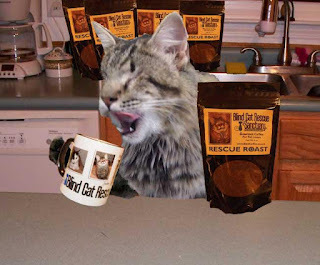 This is great way to spread the word about what the Blind Cat Rescue does. Also thats an awesomely detailed and funny disclaimer. We love Blnd Cat Rescue...and it's great that you are helpng them. It is indeed a wonderful sanctuary. I was very moved by all the cat-idates' choices too. What a great thing you're doing, and thank cod for the Blind Cat Rescue. We don't drink coffee here—well only decaf but I wanted to thank you for mentioning Katie and Glogirly. As you know, I'm her Campaign Manager and if you need anything, just call the office. 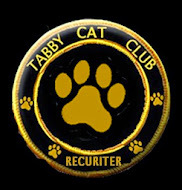 I came aboard the campaign because Blind Cat Rescue is such a pawsome place. and I hope we're able to bring home the Grand Prize to them—not that the other shelters don't deserve it too. I wish Katie and Blind Cat Rescue the best of luck. Katie is helping to spread the word about a very worthy cause. Applause! Oh my CAT! The dad LOVES coffee! We're in!